Cost of Living Is Rising in These 20 Cities — But Are Salaries? See if your city is getting more expensive to live in. The cost of living in major American cities is already pretty high, with residents in the largest urban centers paying significantly more for basic necessities like housing, groceries and utilities than their rural or suburban counterparts. 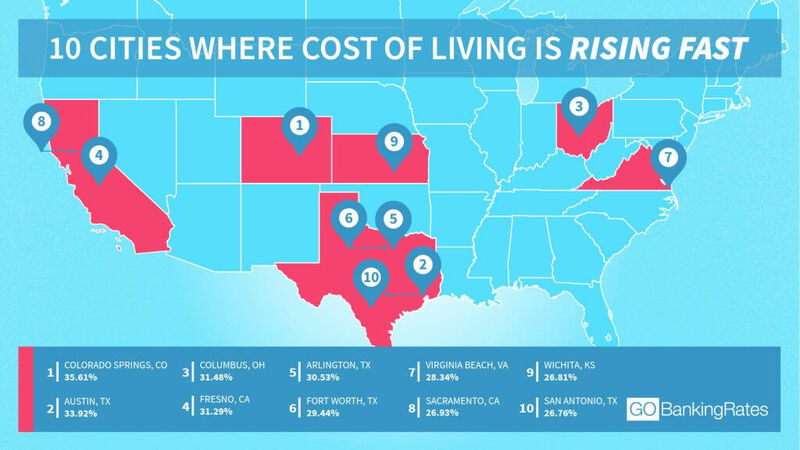 And while city dwellers might be hoping for some respite, the reality is that the cost of living across America only appears to be on the rise, and depending on which city you call home, it might be rising at a disturbingly rapid rate. At least, that’s the conclusion in a recent study by GOBankingRates, which compared the cost of living from 2017 to 2018 to see which major American cities are experiencing the most dramatic uptick in what it costs to live there. The study looked at the annual costs for basic needs like renting a one-bedroom apartment, buying groceries and paying the utility bill in 50 major U.S. cities. It then determined the income needed to live comfortably based on the popular 50/30/20 budgeting rule. The results demonstrate that it’s getting much more expensive to live in these burgs. Among the top 20 cities where the cost to live comfortably increased the most, all experienced a more than 20 percent year-over-year jump. What’s more, the rate at which household incomes are increasing in the same period is well short of those climbing costs. Austin, Texas is a prime example. No city in this study had a bigger jump in median household income from 2017. Incomes jumped by $3,250 to $60,939 a year, an increase of 5.33 percent. Austin is also the city that experienced the largest increase in the income needed to live comfortably in the city — $18,531.88 — and the second-largest increase proportionally — 33.92 percent. That means the rather substantial increase in incomes still fell $15,000 short of the increased cost of living. In fact, the smallest difference between the increase in the cost to live comfortably and the increase in median salary among all 50 cities in the study is still in excess of $8,000. All told, of the 20 cities with the largest jump in the cost to live comfortably, eight still require less than $60,000 a year to make ends meet despite the fact that they experienced an increase to that figure of more than 20 percent from 2017. Click to read cities where incomes are shrinking — and growing — the fastest. Methodology: The study began with the 50 largest cities by population and then found the income necessary to “live comfortably” by determining the typical annual costs for renting a one-bedroom apartment, groceries, utilities, transportation and healthcare. Then, using the 50/30/20 budgeting rule, that figure was doubled to determine the income necessary to “live comfortably,” and compared to the results from 2017 to find those cities with the largest year-over-year increase as a percentage of the 2017 income necessary to live comfortably. You could save big on income taxes by moving abroad. Find out how affordable these thriving cities are today. GOBankingRates > Making Money > Economy > Cost of Living Is Rising in These 20 Cities — But Are Salaries?